Football has become a way of life for A.G. and John Spanos. 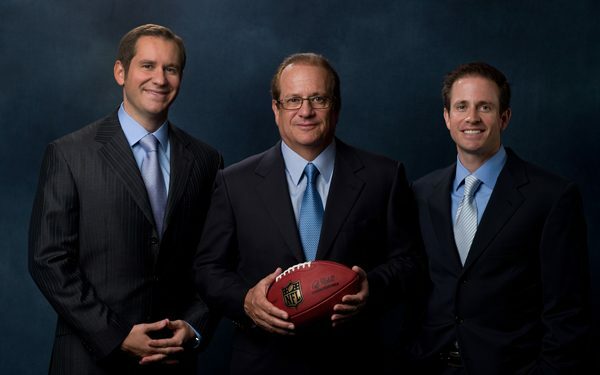 Growing up the sons of Dean Spanos – active owner and chairman of the board of the Los Angeles Chargers franchise – and grandsons to Alex Spanos – an immigrant whose rise to professional success is nearly unparalleled – inspired the brothers and pushed them to discover a deeper and more meaningful passion for the sport of football. While the Spanos’ legacy is unassailably tied to the Chargers (and NFL) brand today, that was not always the case. Originally established and incorporated as the Los Angeles Chargers in 1959, the organization was a founding member of the 8-team American Football League from 1960 until 1970. The franchise’s first owner was Barron Hilton, the son of Hilton Hotels founder Conrad Hilton. By 1970 the AFL and NFL had merged and the Chargers had made a new home for themselves in San Diego. By 1984, they were riding high after stringing together several consecutive winning seasons. In 1984, Alex Spanos had purchased a majority stake (60%) of the franchise for $48.3M and throughout the next ten years, Spanos would continue to purchase the shares of minority owners, buying them out until he owned 97% of the franchise. Today, the Spanos family is sole owner of the franchise valued north of $2B by Forbes. Born in Stockton, Calif., A.G. and John moved with their parents to San Diego before they both reached second grade. While the brothers enjoyed playing in youth sports leagues together, they chose to attend different high schools, which brought forth a healthy dose of sibling rivalry. 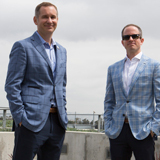 The third-generation league executives also adopted deep family values, instilled by their grandfather Alex Spanos, as they continue to enjoy the rewards and traverse the obstacles that come with managing a professional NFL team. “When I think of sports, especially team sports … accountability, teamwork, and coordination – there are a lot of life lessons in sports that you don’t realize until you’re older,” A.G. adds. 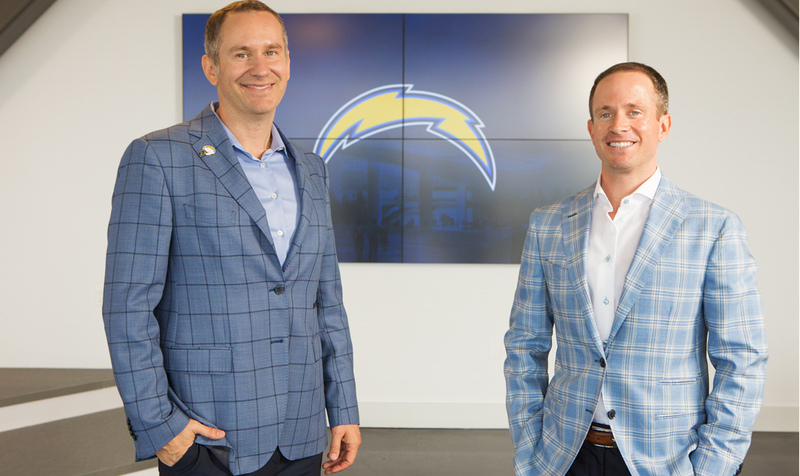 Now as the Chargers’ first season back in Los Angeles approaches, A.G., president of business operations, and John, president of football operations, are kicking off the next era of a family football legacy. The brothers learned quickly that Chargers dream jobs are earned, not given, in the Spanos family. A.G. and John both started working summer jobs for the organization as teenagers, trying their hands at almost every entry-level role in the franchise. The brothers’ roles with the organization expanded after college, and eventually John moved from the team to the league office his first year out of college. Working out of the NFL’s New York City offices, he worked closely with the management council department that handles collective bargaining agreements, salary caps, player contracts, personnel rules, and roster transactions. He returned to San Diego in 2003 to assume the full-time role of assistant in the Chargers’ Pro and College Scouting Department and also worked in the Salary Cap Player Contracts department, assisting with the draft class each year by negotiating contracts and scouting collegiate athletes in the fall. His role grew quickly in the scouting department as he expanded his reach, jumping from visits to 12 schools to nearly 40. Like his brother John, when A.G. wasn’t occupied with classes or assisting the team during college, he had an internship with the Chargers’ local television partner KFMB Channel 8. He then also interned at the New York City NFL office, helping with special league events for business operations and the Football Development Department. After college he spent a season at the NFL Europe League headquarters in London. The Europe league had been around for over 10 years by the time A.G. arrived in London. It had gone through a rebranding, moving away from its former World League of American Football name and folding all existing U.S. teams. A.G. took on a full-time marketing role with the Chargers in 2001. 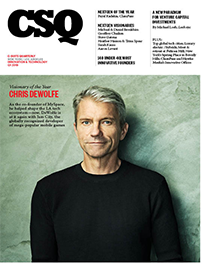 He enjoyed connecting with all of the various facets of the organization and working closely with the public relations and sales teams. “We joke that John spends the money on the field and I have to make the money off of it,” A.G. says. The brothers are very excited about managing their team in LA. They are both confident that the team’s new facilities and direction will offer the organization a competitive advantage. Together they have overcome a myriad of challenges, including the on-the-field product not meeting their expectations and standards. Back-to-back losing records during the past two years were a shock, given the Chargers’ long history of division championship wins. John expects the team to rebound quickly with a new coach and a strong 2017 draft class. A.G. adds that the team already feels welcome in its new market, noting that with the opening of the Rams’ and Chargers’ new NFL Inglewood stadium delayed to 2020, the 30,000-seat StubHub Center in Carson was chosen with fans in mind. Because NFL football translates well to television and fans are accustomed to watching it that way, A.G. mentions how vital it is now to build new stadiums and improve the in-game experience. “You can’t recreate the sights, the smells, the sounds, the experience of being there live (at a game),” A.G. says. While John studies the sport’s changing consumer demographic, A.G. ensures that every decision the franchise makes circles back to one thing – winning games on the field. To strengthen the team’s competitive edge, the brothers constantly research new technologies, platforms, analytics, and sports science studies related to things such as performance, medicine, and nutrition. 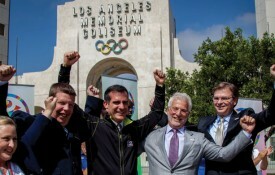 What excites the third-generation visionaries most is bringing their family legacy and decades of tradition to LA. John describes his grandfather Alex as a confident yet humble man who understands the value of asking questions. 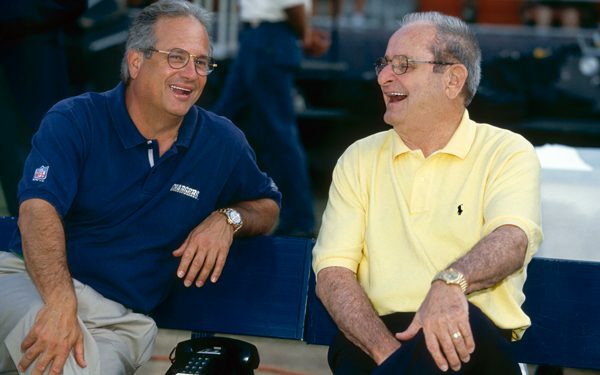 Alex Spanos, the family patriarch, has much to be humble about – but more to be proud of. 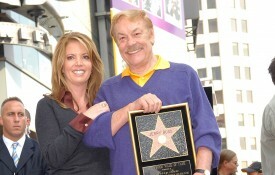 Spanos was born in Stockton, California, the son of Greek immigrants. 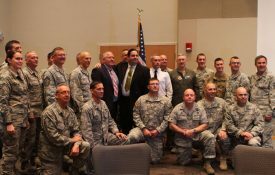 He would be working in his father’s bakery by the age of eight and would ultimately drop out of college to join the Army Air Force pilot training program during World War II; Spanos would serve as a B-29 tail gunner during the war. 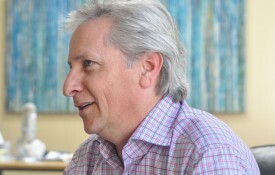 “Now we have to deliver both on the field and with the experience. I’m mostly looking forward to that first game…finally kicking off and beginning the fight for LA. I think that’s going to be a great moment and time for our organization. There is a lot to prepare for…so it’s time to get back to work.” – A.G. In 1951 Spanos borrowed $800 from a local Stockton bank to buy a truck he used to sell sandwiches to migrant farm workers in the San Joaquin Valley. By 1955, he had turned that $800 into $1M. 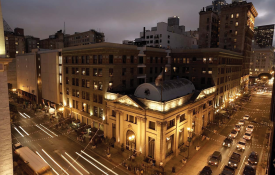 At the urging of his accountants, he invested much of his earning in real estate, founding the A.G. Spanos Companies in 1960, which would become the largest apartment builder in the United States by 1977. Following his real estate rise, as mentioned previously, Spanos purchased a majority stake in the Chargers, which he used as a vessel to give back (the Chargers Community Foundation has awarded more than $13M in scholarships and grants to date). Alex created the original Chargers Foundation to provide opportunity for young community leaders, and the effort gradually evolved to also provide school grants for new gymnasium equipment, football fields, and other resources to improve the lives of children. Today the team supports hundreds of different charitable organizations. Looking back on their careers, A.G. is most proud of growing online store revenue tenfold during 2001-07, while John remembers when the franchise won its division championship five times in six years (2004-09). A.G. is not setting up his two young children to take on the Chargers legacy; rather, he is fostering their interests just as his father did with him. If John has children one day, he plans to similarly encourage them to explore their own passions. In the little free time that executive schedules offer, A.G. enjoys planning active outdoor family adventures and John can be found golfing. 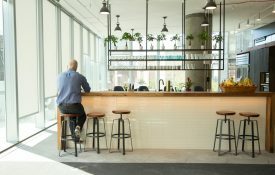 While they may still be reorienting their organization, they already feel part of their community. Most recently they welcomed more than 3,000 guests to the Chargers StubHub Center draft party and watched a season ticket member event sell out in less than 30 minutes. THE IMPORTANCE OF COMMUNICATION. PERSEVERANCE IS A NECESSITY. STILL GETTING TO KNOW THE AREA!